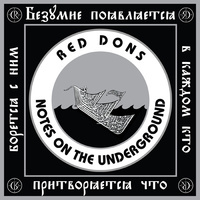 Man In Decline Records - Red Dons - "Notes On The Underground" 7"
Red Dons - "Notes On The Underground" 7"
"Notes on the Underground" is the newest single from the nomadic musical entity that is RED DONS. Formed in Portland in 2005 by Vocalist/Guitarist Douglas Burns (ex-The Observers), bassist Hajji Husayn, and drummer Richard Joachim, RED DONS have managed to stay quite prolific while being spread across the globe and working with a collective of members and contributors. With releases on Deranged, Taken by Surprise, and Dirtnap Records under their belts, "Notes on the Underground," which has been in the works since 2010, finally sees the light of day. Keeping with the signature formula of their previous releases, RED DONS deliver an outstanding record that draws from many musical elements and influences to create a dark, driving, melodic sound that is distinctly their own.